Q: 32 year old male presented to ED after new year Friday night party with chest pain and hypertension. He admits using Cocaine. Initial labs showed hypokalemia of 2.9 mEq/L. What would be your concern? Also, it may cause nausea, hypo or hypertension, thyrotoxicosis, chest pain, venous hyperoxia but with lactic acidosis, central symptoms of agitation and anxiety. Centers for Disease Control and Prevention (CDC). Atypical reactions associated with heroin use--five states, January-April 2005. MMWR Morb Mortal Wkly Rep 2005; 54:793. Fluid overload, acidosis, hyperkalemia and other electrolyte disturbances are well known indications of emergent HD. But some of the manifestations of CKD and/or uremia are under-appreciated where relatively urgent intervention is needed like pericarditis or pleuritis, encephalopathy manifesting as confusion, asterixis, myoclonus, wrist or foot drop, or, even seizures. Also uncontrolled uremic bleeding diathesis may require HD sooner than later. Hemodialysis Adequacy 2006 Work Group. Clinical practice guidelines for hemodialysis adequacy, update 2006. Am J Kidney Dis 2006; 48 Suppl 1:S2. Q; How order for analgesia should be written, differently in dying patient over non-dying patients? Answer: As well known, narcotics are the mainstay of analgesia in end of life (dying) patients. But as dying patients may be frail to ask for medicine, instead of writing PRN (as needed), it should be written as either “offer, may refuse” or “as scheduled for symptoms”. Q: How Guanylate cyclase (sGC)stimulant (Riociguat) (trade name = Adempas) works for thromboembolic Pulmonary hypertension? Answer: It has a dual mode of action. It should be used with extreme caution in patients who are already on nitrates and phosphodiesterase inhibitors. 1. Rubin LJ, Galiè N, Grimminger F, et al. Riociguat for the treatment of pulmonary arterial hypertension: a long-term extension study (PATENT-2). - Eur Respir J 2015; 45:1303. 2. Ghofrani HA, Galiè N, Grimminger F, et al. Riociguat for the treatment of pulmonary arterial hypertension. N Engl J Med 2013; 369:330. Q: With recent advances in laboratory technology, which one precaution should be taken while interpreting the labs in diabetic ketoacidosis (DKA)? Answer: The sodium is traditionally corrected by 1.6 mEq/L for every 100 mg/dL increase in serum glucose, above 100 mg/dL. Some experts prefer adjustment of 2.4 mEq/L. But with recent advances in technology, many labs now report actual sodium. Correcting reported actual sodium with increased glucose level may give a wrong result of plasma osmolality and may lead to erroneous IVF replacement in DKA. It should be checked with local hospital labs personnel. Q: How to calculate the Plasma Exchange volume for plasmapheresis? 1. Rule of thumb: In a regular adult person (70 kg) just use 3 liters of replacement fluid. To recap, plasmapheresis is a universal term used for removal of plasma from the blood using either centrifugation or filtration. In general population, it is used to collect plasma (plasma donation). Therapeutic plasma exchange means removal of patient plasma and replacement with another fluid (donor plasma, colloid, crystalloid). Kaplan AA. A simple and accurate method for prescribing plasma exchange. ASAIO Trans 1990; 36:M597. Q: Continuous infusion and bolus intravenous loop diuretic overall carries same efficacy in heart failure (CHF) patients. Beside, less chances of ototoxicity, what other advantage continuous infusion of loop diuretic may have over IV bolus in CHF patients? Continuous intravenous infusion maintains an effective rate of drug excretion, and inhibits sodium chloride reabsorption in the loop of Henle. IV bolus doses of loop diuretics, as expected are associated with higher and then lower rate of drug excretion, causing unreliable maintenance of sodium chloride hemostasis. 1. Rudy DW, Voelker JR, Greene PK, et al. Ann Intern Med 1991; 115:360. There is no convincing evidence present in literature to support the idea of withholding ACE inhibitors and/or ARBs to prevent CIN. Most of the time, it is done reflexly. Actually, they have been suggested as rather helpful, by blocking renin-angio II vasoconstriction. It should be done only on case to case basis - and should not be held in mild renal insufficiency. 1. Rim MY, Ro H, Kang WC, et al. The effect of renin-angiotensin-aldosterone system blockade on contrast-induced acute kidney injury: a propensity-matched study. Am J Kidney Dis 2012; 60:576. 2. Rosenstock JL, Bruno R, Kim JK, et al. The effect of withdrawal of ACE inhibitors or angiotensin receptor blockers prior to coronary angiography on the incidence of contrast-induced nephropathy. Int Urol Nephrol 2008; 40:749. Q: In last few years cough strength has been advocated as one of the weaning parameter. How cough strength can be objectively measured? Answer: After inserting a spirometer into the ventilator circuit, and then patient instructed to cough, the peak expiratory flow (PEF) is measured. If PEF less than 60 L/min, chances of extubation failure is high. 1. Smina M, Salam A, Khamiees M, et al. Cough peak flows and extubation outcomes. Chest 2003; 124:262. 2. Salam A, Tilluckdharry L, Amoateng-Adjepong Y, Manthous CA. Neurologic status, cough, secretions and extubation outcomes. Intensive Care Med 2004; 30:1334. Heliox, though has a similar viscosity to air but a significantly lower density. In the small airways, resistance is proportional to gas viscosity so Heliox has lesser impact. Moreover, in smaller airways flow is laminar anyway. In the large airways, Heliox's low density produces a higher laminar flow in comparison to turbulent flow of air. Laminar flow generates less resistance. Also, in the large airways where flow is turbulent, resistance is proportional to density, so heliox has a significant clinical impact. Background: Eye care is an essential component in the management of critically ill patients. Standardized eye care can prevent corneal complications in ventilated patients. Objective: This study was designed to compare old and new practices of corneal care for reduction in corneal complications in ventilated patients. Methods: This study was done in three phases each of six month duration. Phase 1 was the ongoing practice of eye care in the unit. Before the start of phase 2, a new protocol was made for eye care. Corneal complications were observed in terms of haziness, dryness, and ulceration. All nursing staffs were educated and made compliant with the new protocol. In phase 2, a follow-up audit was done to check the effectiveness and compliance to protocol. In phase 3, a follow-up audit was started 3 months after phase 2. Results: In phase 1, total ventilated patients were 40 with 240 ventilator days. The corneal dryness rate was 40 per 1000 ventilator days while the haziness and ulceration rate was 16 per 1000 ventilator days each. In the second phase 2, total ventilated patients were 53 making 561 ventilator days. The rate of corneal haziness and dryness was 3.52 and 1.78 per 1000 ventilator days, respectively, with no case of corneal ulceration. In phase 3, the number of ventilated patients was 91 with 1114 ventilator days. The corneal dryness rate was 2.69 while the haziness and ulceration rate was 1.79 each. Conclusion: Protocolized eye care can reduce the risk of corneal complications in ventilated patients. Mohammad Feroz Azfar, Muhammad Faisal Khan, and Abdulaziz H. Alzeer - Protocolized eye care prevents corneal complications in ventilated patients in a medical intensive care unit - Saudi J Anaesth. 2013 Jan-Mar; 7(1): 33–36. Background: Left-sided heart disease (LHD) is the most common cause of pulmonary hypertension (PH). In patients with LHD, elevated left atrial pressure causes a passive increase in pulmonary vascular pressure by hydrostatic transmission. In some patients, an active component caused by pulmonary arterial vasoconstriction and/or vascular remodeling superimposed on left-sided pressure elevation is observed. This “reactive” or “out-of-proportion” PH, defined as PH due to LHD with a transpulmonary gradient (TPG) > 12 mm Hg, confers a worse prognosis. However, TPG is sensitive to changes in cardiac output and left atrial pressure. Therefore, we tested the prognostic value of diastolic pulmonary vascular pressure gradient (DPG) (ie, the difference between invasive diastolic pulmonary artery pressure and mean pulmonary capillary wedge pressure) to better prognosticate death in “out-of-proportion” PH. Methods: A large database of consecutive cases was analyzed. One thousand ninety-four of 2,351 complete data sets were from patients with PH due to LHD. For proof of concept, available lung histologies were reviewed. Results: In patients with postcapillary PH and a TPG > 12 mm Hg, a worse median survival (78 months) was associated with a DPG ≥ 7 mm Hg compared with a DPG < 7 mm Hg (101 months, P = .010). Elevated DPG was associated with more advanced pulmonary vascular remodeling. Conclusions: DPG identifies patients with “out-of-proportion” PH who have significant pulmonary vascular disease and increased mortality. We propose a diagnostic algorithm, using pulmonary capillary wedge pressure, TPG, and DPG in sequence to diagnose pulmonary vascular disease superimposed on left-sided pressure elevation. Q: The goal of optimum PEEP is to? Optimum PEEP continue to remain a concept of debate among critical care practitioners. To make things complicate optimum PEEP is a not a static component, rather is a constantly changing physiological model depending on the relationship between lung volume, respiratory mechanics, dead space, cardiac output, compliance, shunt and oxygenation. But at the end the primary goal is to avoid de-recruitment. This is a misconception that optimum PEEP is to obtain best oxygenation at lowest FiO2, or playing subjectively with acceptable hypoxemia or permissive hypercapnia. It is impossible to decrease dead space to zero. Arguably, closet choice is the E, where the best compliance is obtained but compliance can be deceiving depending on number of recruited and decruited alveoli (2) (3). 1. Caironi P, Cressoni M, Chiumello D, Ranieri M, Quintel M, Russo SG, et al. Lung opening and closing during ventilation of acute respiratory distress syndrome. Am J Respir Crit Care Med. 2009;181:578–86. 2. Suter PM, Fairley HB, Isenberg MD. Effect of tidal volume and positive end-expiratory pressure on compliance during mechanical ventilation. Chest. 1978;73:158–62. 3. Jonson B, Richard JC, Straus C, Mancebo J, Lemaire F, Brochard L. Pressure-volume curves and compliance in acute lung injury: Evidence of recruitment above the lower inflection point. Am J Respir Crit Care Med. 1999;159:1172–8. Q: What is Carnett's sign? Answer: Carnett's sign is an easy to do bedside exam in 5 seconds. It may provide significant clinical clues. This maneuver is performed in patients with acute abdominal pain to differentiate between intraabdominal pathology (like appendicitis) or abdominal wall pathology (like rectus sheath hematoma or hernia). Q: During weaning of Ventilator, how much is load of work due to endotracheal tube (ETT)? There is a continuous debate about applying ETT compensation during weaning. Most ventilators are equipped to provide Automatic Tube Compensation (ATC), but physicians advocating against ATC argues that increased work load by ETT is equivalent to upper airways obstruction immediately following extubation, so ATC is not required. But literature continue to see arguments from both side. 1. Strauss C, Louis B, Isabey D, Lemaire F, Harf A, Brochard L. Contribution of the endotracheal tube and the upper airway to breathing workload. Am J Respir Crit Cared Med 1998;157(1):23-30. 2. Branson RD. Endotracheal tubes and imposed work of breathing: what should we do about it, if anything? Critical Care 2003;7(5):347–348. 3. Figueroa-Casas JB, Montoya R, Arzabala A, Connery SM. Comparison between automatic tube compensation and continuous positive airway pressure during spontaneous breathing trials (SBTs). Respir Care 2010;55(5):549-554. Q: Autonomic dysfunction induced hypotension is common in ICU and may become challenging in weaning vasopressors. All of the following can be used as treatment or as an adjuvant treatment in orthostatic hypotension? Like most MCQs, answer to above question is E (all of the above)!!! Objective of above question to bring in light, the help of recombinant erythropoietin in patients with chronic anemia to counter autonomic hypotension. Also, Nonsteroidal antiinflammatory drugs (NSAID) may be of help too in combination with other agents. There is a long list of medicines which have been tried either solo or in combinations with various success in autonomic dysfunction induced hypotension including midodrine, pyridostigmine, caffeine, synthetic vasopressin analogue desmopressin (dDAVP), Yohimbine, octreotide, dihydroergotamine, droxidopa, atomexitine and others. Though seems very basic but it is of utmost importance to understand that ARDS is a diagnosis of exclusion. 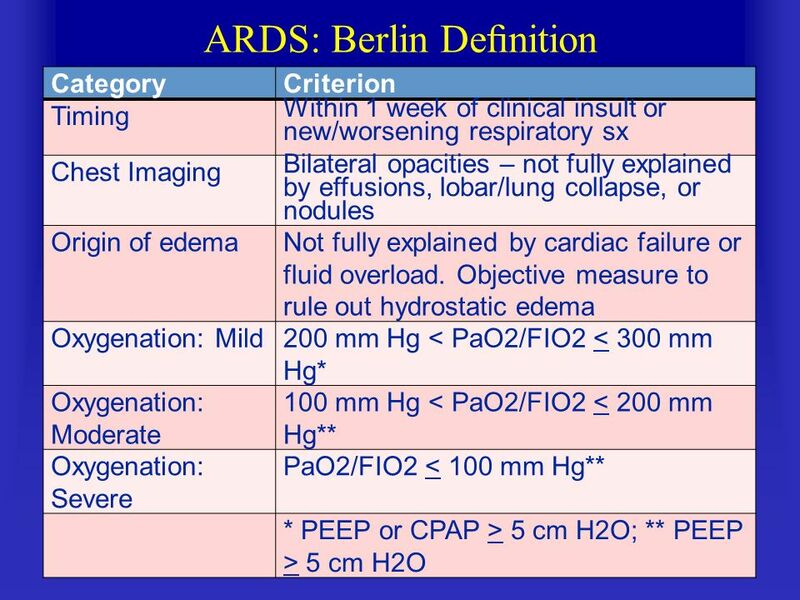 This is the basis of new Berlin definition of ARDS. All other causes of hypoxemia need to be ruled out, with objective evaluation including floatation of Pulmonary Artery Catheter (swan), echocardiography, bronchoscopy, and/or lung biopsy. Q: All of the following can be a clinical sign or symptom of Acute Aortic Dissection except? Objective of above question is to emphasize the unusual presentations of acute aortic dissection which can be devastating if missed or read wrong. It is important to understand that presentation of stroke with negative c/o chest pain and negative CT scan may lead to infusion of thrombolytic which would be catastrophic in acute aortic dissection. Propagation of the dissection proximal into the carotid arteries or even diminished carotid blood flow may present acute aortic dissection as stroke. Expanding aneurysm may cause horner syndrome due to compression on the superior cervical sympathetic ganglion, and hoarseness due to compression of the left recurrent laryngeal nerve. Low D-Dimer actually rules out Aortic dissection. Q: Olanzapine (trade = Zyprexa) is a commonly used drug in ICU for various reasons including delirium and psychosis. In which subset of patients, it may not work or require higher dose? Answer: Olanzapine after oral dose is removed by the hepatic first-pass effect. Patients who are smoker have increase activity of CYP1A2, and may significantly increase the hepatic first-pass clearance of Olanzapine. Q: All of the following increase the Rapid Shallow Breathing Index (RSBI) except? It is an usual clinical practice to insert lower sized diameter ETT in females - and both these factors may falsely give high RSBI, independent of the weaning outcome. Another common bedside mistake is to measure RSBI right after suctioning, which may also falsely increase RSBI. 1. Epstein SK, Ciubotaru RL. Influence of gender and endotracheal tube size on preextubation breathing pattern. Am J Respir Crit Care Med 1996; 154:1647. 2. Seymour CW, Cross BJ, Cooke CR, et al. Physiologic impact of closed-system endotracheal suctioning in spontaneously breathing patients receiving mechanical ventilation. Respir Care 2009; 54:367. Q: Which one unique feature distinguish filarial lymphangitis from other causes of lymphangitis? Answer: Filarial lymphangitis occurs in a retrograde progression, means it spread away from the lymph nodes, where parasite resides. As parasites die they causes retrograde lymphangitis. Acute episode is followed by its complications as thickening of skin and subcutaneous tissue and superimposed bacterial infection. Organisms responsible are wuchereria bancrofti, B. malayi, and B. timori. It may be of interest for intensivists that adult worms can seen by bedside ultrasound of the inguinal, crural, and axillary lymph nodes and possibly adjacent vessels! 1. Pani SP, Yuvaraj J, Vanamail P, et al. Episodic adenolymphangitis and lymphoedema in patients with bancroftian filariasis. Trans R Soc Trop Med Hyg 1995; 89:72. 2. Dreyer G, Noroes J, Figueredo-Silva J. New insights into the natural history and pathology of bancroftian filariasis: implications for clinical management and filariasis control programmes. Trans R Soc Trop Med Hyg. 2000; 94(6): 594-6. 3. Dreyer G, Noroes J, Figueredo-Silva J, Piessens WF. Pathogenesis of lymphatic disease in bancroftian filariasis: a clinical perspective. Parasitol Today. 2000; 16(12): 544-8. 4. Fox LM, Furness BW, Haser JK, Brissau JM, Louis-Charles J, Wilson SF, Addiss DG, Lammie PJ, Beach MJ. Ultrasonographic examination of Haitian children with lymphatic filariasis: a longitudinal assessment in the context of antifilarial drug treatment. Am J Trop Med Hyg. 2005; 72(5): 642-8. Q: The right common carotid artery has been used for cannulation for VA ECMO (Extracorporeal membrane oxygenation) in patients with severe peripheral arterial disease. What is the highest risk involved with this approach? Answer: 5 to 10 percent risk of a clinically significant watershed cerebral infarction. In situations where femoral access is not viable, experts recommend the subclavian approach. But again, clinical situation precedes any decision. Navia JL, Atik FA, Beyer EA, Ruda Vega P. Extracorporeal membrane oxygenation with right axillary artery perfusion. Ann Thorac Surg 2005; 79:2163. Q: What is "rebound pain" effect of morphine in Hemodialysis patients? Answer: Morphine and its metabolites get removed with dialysis and may cause “rebound” pain effect. Patient with renal insufficiency but not on dialysis should receive morphine with caution. Morphine gets metabolized in the liver to morphine-3-glucuronide, morphine-6-glucuronide and normorphine, which are excreted via kidneys. About 10% of Morphine remain unchanged. Though parent compound gets excreted fine in renal insufficiency, excretion of metabolites get compromised in renal insufficiency. The worrisome metabolite of morphine is morphine-6-glucuronide, also known as M6G. It is extremely potent (more than its parent compound), crosses the blood-brain barrier and may cause life-threatening respiratory depression as well as hallucinations. Though it is removable via dialysis (which takes away analgesic effect and causes rebound pain effect), it takes a long time to diffuse out of CNS and continue to have CNS depression effect. Moreover, on the other hand, morphine-3-glucuronide (M3G) causes behavioral excitation. In conclusion, Morphine in patients with renal insufficiency can cause very unpredictable effects. Dean M. Opioids in renal failure and dialysis patients. J Pain Symptom Manage. 2004;28:497-504. Q: Though clinical judgement prevails, but why it is recommended to continue intravenous infusion of diltiazem after bolus for control of atrial fibrillation with Rapid Ventricular Response (RVR) rate? Answer: It is recommended to continue intravenous infusion of diltiazem after bolus for control of atrial fibrillation with Rapid Ventricular Response (RVR) rate because control of the ventricular rate gets lost in about 90 minutes after bolus dose. The objective of above MCQ is to emphasize the point that increased Plateau Pressure (Pplat) on ventilator represents static compliance of lung parenchyma, chest wall, and abdomen. Effect of abdominal distension on ventilator mechanics is very under-appreciated. Choice D is wrong as an increase in resistance of the airways due to various reasons including obstruction of the endotracheal tube is measured by Peak Pressure (Ppeak). Choice E is wrong as Plateau Pressure (Pplat) on ventilator represents recorded pressure during a pause at end-inspiration. 1. Tobin MJ. Respiratory monitoring. JAMA 1990; 264:244. 2. Marini, JJ. Lung mechanics determinations at the bedside: instrumentation and clinical applications. Respir Care 1990; 35:669. 3. Tobin MJ. Advances in mechanical ventilation. N Engl J Med 2001; 344:1986. Against common concept that females are more prone to get more severe pulmonary embolism, male gender is found to have a higher risk of more severe PE. Full PESI has 11 identified points, which was later simplified to 6 points. 1. Aujesky D, Obrosky DS, Stone RA, et al. Derivation and validation of a prognostic model for pulmonary embolism. Am J Respir Crit Care Med 2005; 172:1041. 2. Jiménez D, Aujesky D, Moores L, et al. Simplification of the pulmonary embolism severity index for prognostication in patients with acute symptomatic pulmonary embolism. Arch Intern Med 2010; 170:1383. Q: All of the following predicts probable failure of non-invasive positive pressure ventilation (NIPPV) in patients with acute exacerbation of COPD except? Glasgow Coma Score less than 11 predicts probable failure of trial of standard two hours of NIPPV in patients with acute exacerbation of COPD. All other choices are applicable too. Also, if patient PH does not show any improvement or remain less than 7.25 after 2 hours trial of NIPPV, predicts probable intubation. 1. Confalonieri M, Garuti G, Cattaruzza MS, et al. A chart of failure risk for noninvasive ventilation in patients with COPD exacerbation. Eur Respir J 2005; 25:348. 2. Stefan MS, Shieh MS, Pekow PS, et al. Trends in mechanical ventilation among patients hospitalized with acute exacerbations of COPD in the United States, 2001 to 2011. Chest 2015; 147:959. 3. Phua J, Kong K, Lee KH, et al. Noninvasive ventilation in hypercapnic acute respiratory failure due to chronic obstructive pulmonary disease vs. other conditions: effectiveness and predictors of failure. Intensive Care Med 2005; 31:533. 4. Carratù P, Bonfitto P, Dragonieri S, et al. Early and late failure of noninvasive ventilation in chronic obstructive pulmonary disease with acute exacerbation. Eur J Clin Invest 2005; 35:404. Q: pRBC can be freezed and can be preserved for how many years? Answer: pRBC which is frozen at -80ºC in 40% glycerol can be preserved for 10 years. It is found to be of extreme value for patients who have very rare type of blood group or if IgA negative donor cannot be found for patients with IgA deficiency. Only drawback of frozen pRBC is time needed to thaw and wash the product. 1. Lecak J, Scott K, Young C, et al. Evaluation of red blood cells stored at -80 degrees C in excess of 10 years. Transfusion 2004; 44:1306. 2. Fabricant L, Kiraly L, Wiles C, et al. Cryopreserved deglycerolized blood is safe and achieves superior tissue oxygenation compared with refrigerated red blood cells: a prospective randomized pilot study. J Trauma Acute Care Surg 2013; 74:371. Q: All of the followings can be used in the healing of pressure ulcers in long-term patients except? Pressure ulcer is one potential catastrophe in ICU which can be prevented with proper care and designated protocol. Various adjunctive therapies have been used to heal pressure ulcer besides standard dressing, debridement and use of transparent films. Negative pressure wound therapy (woundVac) enhances wound healing by increasing blood flow and formation of granulation tissue. HBOT is used with less frequency. Ultrasound, electrical stimulation, application of growth factors, topical oxygen (not topical nitrogen - Choice E), pulsed radiofrequency energy therapy and electromagnetic therapy have also been proposed. By Anatomy, veins are usually thin-walled and relatively fragile. Creation of AVF subjects vein to high pressure and high flow, and causes a series of changes characterized by dilation and thickening of the venous wall. It requires at least 2 weeks of time period for AVF to be stable/mature to access. Accessing AVF prior to maturation may cause life-threatening bleeding and complications. Pisoni RL, Young EW, Mapes DL, et al. Vascular access use and outcomes in the U.S., Europe, and Japan: results from the Dialysis Outcomes and Practice Patterns Study. Nephrol News Issues 2003; 17:38. Q: Is obtaining organ donation from a death row prisoner in exchange of reduced sentence is ethical? It has been suggested to offer reduced sentence in exchange of organs to death row prisoners. But it raises many ethical questions. It may influence jurors, displace justice and manipulation of system by different parties involved. So far, the United Network for Organ Sharing (UNOS) and the Organ Procurement and Transplantation Network (OPTN) has not favored this approach. Q: 44 year old male is admitted to ICU with fever, sepsis and get diagnosed with acute cholingitis. GI service has been called for emergent endoscopic retrograde cholangiopancreatography (ERCP). Which one request you will make to GI service while performing ERCP? Answer: To send cultures obtained from bile (or stents) removed at ERCP to help direct antibiotic therapy. E. coli is the most common bug followed by Klebsiella and Enterobacter species. 1. Negm AA, Schott A, Vonberg RP, et al. Routine bile collection for microbiological analysis during cholangiography and its impact on the management of cholangitis. Gastrointest Endosc 2010; 72:284. Q: After finishing the insertion of Central Venous Catheter (CVC), resistance was felt while injecting and checking back-flow of distal port. What should be your first concern? Retained guidewire is a well know complication of CVC insertion. Even before the guidewire is suspected to be lost, resistance to injection and poor backflow from the distal (usually brown) port is the first sign of the retained wire inside the vessel. X-ray should be obtained promptly. Schummer W, Schummer C, Gaser E, Bartunek R. Loss of the guide wire: Mishap or blunder? Br J Anaesth. 2002;88:144–6. Q: 62 year old male had a witness embolic CVA in the hospital. Stroke team was promptly called and TPA was started while in radiology suite finishing CT scan protocol. What could be one hind side of giving thrombolytic therapy too early in CVA? Answer: Hyperacute thromboemboli is usually platelet-rich and this can make is resistant to thrombolysis. But this clinical pearl is only of academic importance and should not play any role in making the decision for thrombolytic therapy in CVA, as there is no way to known the exact composition of the thromboembolic material. Fulgham JR, Ingall TJ, Stead LG, et al. Management of acute ischemic stroke. Mayo Clin Proc 2004; 79:1459. Administration of etomidate during intubation may cause myoclonus which may be read as seizure episode. Etomidate is unique in the sense that though it decreases cerebral blood flow, it preserves cerebral perfusion pressure. This myoclonus is benign. Most intubated patients go on sedation post-intubation and myoclonus do not recur. Vigilance is required to not to read this myoclonus as seizure and should not require million dollar workup unless clinically indicated. Q: Why purpura fulminans requires treatment with protein C concentrate instead of FFP though it contains Protein C? Answer: Half life of Protein C in FFP is very short, so it should not be used as a source of protein C.
Smith OP, White B, Vaughan D, et al. Use of protein-C concentrate, heparin, and haemodiafiltration in meningococcus-induced purpura fulminans. Lancet 1997; 350:1590. Dreyfus M, Magny JF, Bridey F, et al. Treatment of homozygous protein C deficiency and neonatal purpura fulminans with a purified protein C concentrate. N Engl J Med 1991; 325:1565. Q: What does NPO stand for? To be precise, NPO stands for Nulla Per Os which is a latin for Nothing by mouth. Platelets are stored at room temperature. This is to prevent clustering of von Willebrand factor receptors on the platelet surface due to cold temperature. This decreases the shelf life of platelets to only 5 days as after that chances of bacterial growth is high. Murphy S, Gardner FH. Effect of storage temperature on maintenance of platelet viability--deleterious effect of refrigerated storage. N Engl J Med 1969; 280:1094. Acute fatty liver of pregnancy happens in the third trimester. Prompt delivery of the fetus should be the goal but after stabilization of mother. Depending on clinical situation C-section may be required but need close monitoring and treatment of coagulopathy. Q: What is the best time to initiate prone positioning in ARDS to get maximum benefit? As per latest literature, we have learned that prone positioning is most efficacious if initiated early. If patient get relatively stabilized and if it is evident from clinical picture that respiratory failure is severe, it would not be bad to keep low threshold to initiate prone positioning. Lung recruitment is most effective in early phase of ARDS. Clostridium contains about 100 species but only handful are known to cause disease in humans. C. perfringens, botulinum, difficile and tetani are well known. Less described is Clostridium septicum which has unique property to cause spontaneous gas gangrene without any trauma! Source is usually GI tract and is well known to be associated with colorectal cancer. It can quickly spread via its well known necrotic and lethal toxin called alpha toxin, if for any reason gut lining becomes necrotic or inflamed. Its other toxins are beta, gamma and delta toxins. 2. Liechti, ME; Schob, O; Kacl, GM; Caduff, B (2003). "Clostridium septicum aortitis in a patient with colon carcinoma". Eur J Clin Microbiol Infect Dis. 22: 632–634. Q: What is the best prevention against development of femoral pseudoaneurysm after inadvertent femoral artery puncture or presumed hematoma formation after line removal? Answer: To continue to compress site for 5 more minutes, after bleeding noticed to be stop. Most femoral pseudoaneurysms formed within seventy two hours after removal of the arterial line or puncture. It has been shown that just spending extra five minutes to compress the site, even after bleeding seems to be stopped reduces the incidence of pseudoaneurysm formation. 1. El-Jack SS, Ruygrok PN, Webster MW, et al. Effectiveness of manual pressure hemostasis following transfemoral coronary angiography in patients on therapeutic warfarin anticoagulation. 2. Am J Cardiol 2006; 97:485. 1. Katzenschlager R, Ugurluoglu A, Ahmadi A, et al. Incidence of pseudoaneurysm after diagnostic and therapeutic angiography. Radiology 1995; 195:463. Q; 72 year old male with chronic A. fib., on coumadin - admitted with fall and subdural hematoma. Patient was intubated in ER for the protection of airway. Neurosurgery service decided to follow the patient closely at this point. Ideally, at what interval CT scan of the head should be repeated? Due to the danger of rapid hematoma expansion, particularly in patients with clinical compromise, a quick follow up CT head should be performed. Oertel M, Kelly DF, McArthur D, et al. Progressive hemorrhage after head trauma: predictors and consequences of the evolving injury. J Neurosurg 2002; 96:109. Servadei F, Nasi MT, Cremonini AM, et al. Importance of a reliable admission Glasgow Coma Scale score for determining the need for evacuation of posttraumatic subdural hematomas: a prospective study of 65 patients. J Trauma 1998; 44:868. Q: 62 year old male with CHF is admitted to ICU with "V. Tach. storm". All measures to control his arrhythmia failed and cardiology service decided to do "Percutaneous Stellate Ganglion Block" (PSGB). At what level of spine it is usually done? Left "Percutaneous Stellate Ganglion Block" (PSGB) can be used as a last resort to suppress "V. Tach and V. Fib" in patients who are refractory to all measures including ablation. It is performed usually at the junction between the T1 vertebral body and the transverse process under fluoroscopy and digital subtraction angiography. Q: Beside acute myocardial infarction, in which one condition serial followup of troponin may be of help? Answer: It has been suggested to follow troponin levels as a method for detecting cardiotoxicity after high-dose cardio-toxic chemotherapy, and predicting future cardiomyopathy in such patients. Cardinale D, Sandri MT, Martinoni A, et al. Left ventricular dysfunction predicted by early troponin I release after high-dose chemotherapy. J Am Coll Cardiol 2000; 36:517. Q; What one precaution should be taken while testing for capillary refill time? Ideally Capillary Refill Time should be performed by holding a hand higher than heart-level. It is usually done by pressing the soft pad of a fingernail until it turns white, then taking note of the time needed for the color to normalize with release of pressure. It takes about three seconds. Q: What is Mirizzi's syndrome? 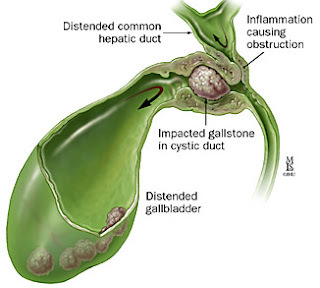 Answer: Mirizzi's syndrome is a complication where a gallstone gets impacted in the cystic duct or neck of the gallbladder resulting in compression of the common bile duct or common hepatic duct, causing obstructive jaundice. Q: Due to history of pulmonary hypertension, 36 year old female is admitted to ICU for observation. Patient is on Epoprostenol via PICC line. During transport PICC line fell out by 6 cm. 'Pulmonary HTN' team requested to change or insert a new PICC line. What precaution is extremely important to take? Answer: Epoprostenol has a very short half-life of about 2-3 mins. Moreover, it is unstable at room temperature. Extreme caution should be taken while changing or priming catheter as any change in dose, incidental bolus or interruption of the infusion can cause severe rebound pulmonary hypertension, which may become fatal. Tumor Lysis Syndrome is potentially an avoidable situation and may become fatal without adequate preparation in advance in tumors known to cause TLS. Hydration, Furosemide, electrolyte and uric acid management are the cornerstone of TLS. HD becomes an indication in severe oliguria/anuria, persistent hyperkalemia, Calcium-phosphate product more or equal to70 mg2/dL2 and calcium level above 18 mg/dL. Q: How cardiac drug Ivabradine works? Answer: Ivabradine (Corlanor), approved by FDA in 2015 works in heart by acting at "Funny Channel" (yes! it is the name). It is indicated for angina and CHF, when patient either fail or cannot tolerate beta-blockers. It is popularly known as "cardiotonic", as it is reported to decrease rate of hospitalizations related to CHF. Its major side effect is "luminous phenomena" (sensations of enhanced brightness around visual field). Also, it need to be use with caution due to its various drug interactions. Swedberg K, Komajda M, Böhm M, Borer JS, Ford I, Dubost-Brama A, Lerebours G, Tavazzi L; on behalf of the SHIFT Investigators (2010). "Ivabradine and outcomes in chronic heart failure (SHIFT): a randomised placebo-controlled study". The Lancet. 376 (9744): 875–885. Aspirin/ASA (antiplatelet agents) should be held for first 24 hours after thrombolytic therapy in CVA. ARTIS trial was stopped early due to higher symptomatic intracranial bleed in the intravenous aspirin group, and at 3 months, the favorable outcome was similar for both the aspirin and the no aspirin groups. Repeat CT scan and MRI may be sought after TPA in CVA patients, but they are not required to start ASA after 24 hours. Zinkstok SM, Roos YB, ARTIS investigators. Early administration of aspirin in patients treated with alteplase for acute ischaemic stroke: a randomised controlled trial. Lancet 2012; 380:731. Q: Which infectious cause is prone to give acquired protein C deficiency? Lorenzo Alberio, Bernhard Lämmle, and Charles T. Esmon - Protein C Replacement in Severe Meningococcemia: Rationale and Clinical Experience - Clin Infect Dis. (2001) 32 (9): 1338-1346. Q: 44 year old male is in ICU with severe ARDS. Earlier, high PEEP caused pneumothorax and patient required the anterior chest tube. Air leak is still evident on chest tube. Patient is very unstable for transfer to ECMO equipped institution. As a rescue, you decided to try prone positioning. Is chest tube with air leak is an absolute contraindication to prone positioning? Answer: No - it is a relative contraindication. If secured safely, chest tubes/pacemakers/catheters are not contraindicated for prone positioning. Q: 58 year old male with PMH of Diabetes, HTN and renal insufficiency is transferred from floor to ICU with sepsis. On examination, you find various unsuccessful attempts of inserting femoral central line. Subsequent workup diagnosed him with polymicrobial hip septic arthritis. What could be the causes of polymicrobial septic arthritis? Most interesting in polymicrobial septic arthritis are case reports after (multiple) femoral venipunctures. 1. Fromm SE, Toohey JS. Septic arthritis of the hip in an adult following repeated femoral venipuncture. Orthopedics 1996; 19:1047. Q: One definition of chylothorax is pleural fluid's triglyceride level greater than 110 mg/dL. What is the other definition of chylothorax, if triglycerides concentration does not reach at 110 mg/dL but clinically chylothorax seems highly suspected? In about 20 percent of chylothorax, triglyceride in pleural fluid may not reach the cutoff number of 110 mg/dL. In such scenarios presence of chylomicrons in the pleural fluid is enough to label it as chylothorax. Major differential diagnosis of chylothorax is with cholesterol effusions, which may be diagnostic with the presence of cholesterol crystals. Chylomicrons are not present in cholesterol pleural effusions and are diagnostic of chylothorax even if triglycerides is not at 110 mg/dL. Q: 32 year old female is admitted to ICU with hypotension and possible sepsis. Patient's past medical history is unremarkable except that she started working 6 weeks ago at the spa to do pedicures. Knowing her history, out of the following which one would be your concern? The objective of above question is to address risk factors and knowledge of unusual infectious bugs may encounter in ICU. With the explosion of spas and salons in urban settings, ICU physicians are expected to know about Mycobacterium fortuitum as a risk. Also reported in similar setting is Mycobacterium mageritense. 1. Sniezek PJ, Graham BS, Busch HB, et al. Rapidly growing mycobacterial infections after pedicures. Arch Dermatol 2003;139:629-34. 2. Winthrop KL, Albridge K, South D, et al. The clinical management and outcome of nail salon-acquired Mycobacterium fortuitum skin infection. Clin Infect Dis 2004;38:38-44. 3. Winthrop KL, Abrams M, Yakrus M, et al. An outbreak of mycobacterial furunculosis associated with footbaths at a nail salon. N Engl J Med 2002;346:1366-71. 5. Vugia DJ, Jang Y, Zizek C, Ely J, Winthrop KL, Desmond E. Mycobacteria in nail salon whirlpool footbaths, California. Emerg Infect Dis 2005;11:616-8. Q: 32 year old female is admitted to ICU with acute exacerbation of Multiple Sclerosis (MS). She is responding well to steroid treatment. Out of the following, which Vitamin is recommended as an adjuvant treatment in MS and should be added to her profile? Multiple studies have shown the direct beneficial effect of Vitamin D on preventing acute flares of MS. Though still, the exact mechanism is not clear but the answer may lie in the old wisdom of protective sunlight effect on MS. Use of Vitamin D in MS is now considered as a standard of treatment. 1. van der Mei IA, Ponsonby AL, Dwyer T, et al. Past exposure to sun, skin phenotype, and risk of multiple sclerosis: case-control study. BMJ 2003; 327:316. 2. Salzer J, Hallmans G, Nyström M, et al. Vitamin D as a protective factor in multiple sclerosis. Neurology 2012; 79:2140. 3. Mowry EM, Waubant E, McCulloch CE, et al. Vitamin D status predicts new brain magnetic resonance imaging activity in multiple sclerosis. Ann Neurol 2012; 72:234. 4. Ascherio A, Munger KL, White R, et al. Vitamin D as an early predictor of multiple sclerosis activity and progression. JAMA Neurol 2014; 71:306. Q: 52 year old male is transferred from neurology floor to ICU for intubation and emergent plasmapheresis due to exacerbation of myasthenia gravis. On exam, you found following skin findings. With given history, your diagnosis and concern? Pemphigus Vulgaris is an autoimmune disorder found to be associated with myasthenia gravis and thymoma. It requires high dose corticosteroids treatment, otherwise can be fatal. First described 90 years ago1 but is still a valid association and should be investigated and treated aggressively. 1. Senear-Usher, -F.E. and Usher, B. An unusual type of pemphigus combining features of lupusery the matosus. Arch. Derm: Syph., 1926; 13 761. 2. Winkler DT, Strnad P, Meier ML, Roten S, Went P, Lyrer P, Steck AJ: Myasthenia gravis, paraneoplastic pemphigus and thymoma. A rare triad. J Neurol. 2007, 254 (11): 1601-1603. 3. Meyer S, Kroiss M, Landthaler M, Vogt T: Thymoma, myasthenia gravis, eruptions of pemphigus vulgaris and a favourable course of relapsing melanoma: an immunological puzzle. Br J Dermatol. 2006, 155 (3): 638-640. Q: Out of following organisms which one is prone to produce adrenal insufficiency? Review of literature shows many case reports with disseminated histoplasmosis affecting adrenal glands. Mostly it is reported as unilateral involvement but bilateral involvement has been reported too. Diagnosis is usually made by fine needle aspiration cytology. 1. Rana C, Krishnani N, Kumari N. - Bilateral adrenal histoplasmosis in immunocompetent patients. - Diagn Cytopathol. 2011 Apr;39(4):294-6. 2. Kumar M, Singh S, Govil S. Adrenal Histoplasmosis: Clinical presentation and imaging features in 9 cases. Abdominal Imaging, 2003, Sept-Oct.; 28(5); 703 - 708. Chvostek sign can be demonstrated by briskly tapping the facial nerve at about 2 cm anterior to the external auditory meatus. Depending on the level of hypocalcemia, a response can be graded from mild to severe. Twitching occurs first at the angle of the mouth, then by the nose, the eye, and then the facial muscles. Chvostek sign has high sensitivity but less specificity for hypocalcemia. It can occur without calcium deficiency. In contrast, Trousseau sign is less sensitive but highly specific for hypocalcemia. It can be demonstrated by inflating the blood pressure cuff to 20 mm Hg above systolic blood pressure for 3-4 minutes. In hypocalcemia, it will cause a flexion of the wrist and metacarpal phalangeal joints with the extension of the interphalangeal joints and adduction of the thumb, known as carpal spasm. Q: What is 'absorptive atelectasis'? Answer: Absorptive atelectasis is one of the "not very much desired" consequence of high FiO2. Higher oxygen level in lung causes "washout of alveolar nitrogen" which results in alveolar atelectasis. This is probably due to the fact that oxygen diffuses from alveoli to capillaries at faster rate than it gets replenish by inhaled oxygen. Also, particularly in ARDS patients, surfactant abnormalities helps to superimpose the issue. Treatment is applying recruitment maneuver and application of optimum PEEP, followed by FiO2 to keep PaO2 around 65 mm Hg. Santos C, Ferrer M, Roca J, et al. Pulmonary gas exchange response to oxygen breathing in acute lung injury. Am J Respir Crit Care Med 2000; 161:26. Patient's risk of becoming prediabetic or diabetic just even after first/one episode of acute pancreatitis in one year is around fifteen percent, and instead of decreasing it may increase further in next five years. Das S, Singh PP, Phillips A, et al. Newly diagnosed diabetes mellitus after acute pancreatitis: A systematic review and meta-analysis. Gut 2014; 63. Q: How long does it take for hepatic encephalopathy to manifest after Transjugular intrahepatic portosystemic shunt (TIPS)? Answer: Contrary to popular belief, it takes about two to three weeks for hepatic encephelopathy to fully sits in after TIPS procedure in cirrhotic patients.1 Unfortunately, no prophylaxis (lactulose, rifaximin etc.) prevents it.2 Once encephalopathy sits in after TIPS, all offending causes should be eliminated along with standard of care treatment for hepatic encephalopathy. 1. Riggio O, Merlli M, Pedretti G, et al. Hepatic encephalopathy after transjugular intrahepatic portosystemic shunt. Incidence and risk factors. Dig Dis Sci 1996; 41:578. 2. Riggio O, Masini A, Efrati C, et al. Pharmacological prophylaxis of hepatic encephalopathy after transjugular intrahepatic portosystemic shunt: a randomized controlled study. J Hepatol 2005; 42:674. Q: Folic acid is recommended as an adjuvant therapy in Ethylene Glycol or Methanol poisoning if a patient receives Famipzol as a treatment. What is the dose? In the situation like above, the dose of folic acid is 50 mg IV every six hours till clinical and laboratory parameters normalize. Folinic acid can be used in place of folic acid with similar dosing. The objective of above question is to point the way higher dose of folic acid in toxic alcohol poisonings treatment, than in other clinical situations. The evidence is weak but it is a common practice to add thiamine and pyridoxine along with folic acid. Barceloux DG, Bond GR, Krenzelok EP, et al. American Academy of Clinical Toxicology practice guidelines on the treatment of methanol poisoning. J Toxicol Clin Toxicol 2002; 40:415. Q: Which one technique during whole lung lavage for pulmonary alveolar proteinosis increases the chance of recovery of the lipoproteinaceous material? After the desired amount of saline (usually 1 to 1.5 Litre) is flowed in, chest percussion for about 5 minutes, increases the recovery of the lipoproteinaceous material. Usually, it takes about 10 to 15 lavages for each lung. Hammon WE, McCaffree DR, Cucchiara AJ. A comparison of manual to mechanical chest percussion for clearance of alveolar material in patients with pulmonary alveolar proteinosis (phospholipidosis). Chest 1993; 103:1409. Q: 28 year old male student from Brazil, who visited his family during the months of summer is brought to ER with seizures. CT Head showed multiple cysts consistent with Neurocysticercosis (NCC). The patient was promptly treated with antiepileptics in ER and transferred to ICU. 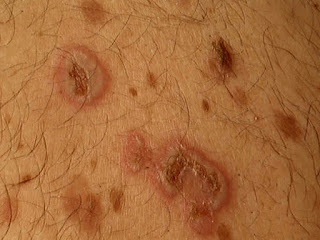 Following of which is recommended prior to the start of treatment for Neurocysticercosis (NCC)? Treatment of NCC is multifacet and carries multiple challenges. Patients from the endemic area for NCC also have high risks for latent TB and strongyloidiasis. As treatment of NCC also requires treatment with steroid along with antiparasitics, it is recommended to check for latent TB. Also, treatment of NCC may cause dissemination of strongyloidiasis, which may require treatment prior to NCC. Multiple cysts in the brain carry the risk of hydrocephalus with the treatment of NCC and may require ventriculostomy. Similarly, initiation of the treatment of NCC may cause chorioretinitis, retinal detachment, or vasculitis, due to massive inflammation from the breakdown of cellular walls of parasites. Proper ocular exam is required as surgical intervention may be needed to remove ocular cysts, prior to antiparasitic treatment.